For many of us, our phones and laptops are our primary music players, whether they're used for playing locally saved files or streaming music from a NAS box or an online service such as Spotify or TuneIn Radio. So for playing music when we're home we might plug our laptop into the stereo or drop our phone into a speaker dock. That's fine until we want to send a tweet or browse the web and our phone is sitting in a dock on the other side of the room. One solution, then, is to use a Bluetooth streamer which you plug into your hi-fi, TV soundbar, or other speaker system and then you can stream to it from your phone, tablet or laptop. 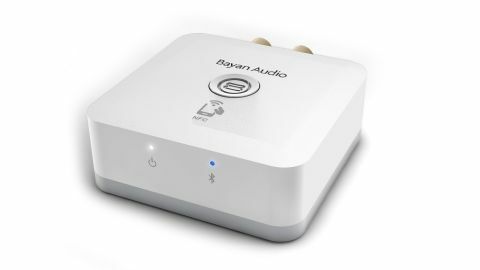 That's what Bayan Audio's StreamPort Universal offers in a compact little unit that takes just a minute or so to set up. In the box you'll find a brief instruction manual, the receiver, a power supply and two connection cables so you can connect the receiver to your system using either a 3.5mm jack or L/R RCA input. The StreamPort Universal feels well built and is available in black or white. A nice touch is that the power supply and audio leads match the colour of the receiver. On the front of the receiver are two LEDs – a white one to show the device is powered on and a blue LED to show that it's paired via Bluetooth, while on the back you'll find the power input and audio outputs. On the top of the unit is the power button, which you hold briefly to switch the streamer on and for a little longer to begin the Bluetooth pairing process. If your phone features NFC you can pair it with the StreamPort by enabling NFC on your handset, pressing and holding the button on the top of the streamer for a few seconds and then placing your phone on top of the StreamPort to pair the devices. If you don't have NFC (you want to pair a laptop or an iPhone, for example) you can do that manually instead. And once you've paired your device with the receiver you can stream your music. The StreamPort Universal uses Bluetooth 4.0, which won't be compatible with every device, but it will pair with devices back to Bluetooth version 2.1. Bayan Audio says that it works with iPhone 5, iPads, iPods and iPod nano and "most" Android and Windows smartphones and tablets. To connect, the device you want to stream from must also be A2DP compatible. A2DP has been around for a few years now, so it's unlikely you'll have a problem but do check the specs for your handset, tablet or laptop if you want to be certain. Sound-wise, we have no complaints, but do beware the range. While it's claimed the effective range is up to 10 metres, wander through a doorway and that decreases markedly. So while you can stream music to your stereo while you're sitting on the sofa using your handset in the same room, don't expect to be able to stick your phone in your pocket and go into another room without the music dropping out. The StreamPort Universal isn't the cheapest Bluetooth streamer out there. The older Belkin Bluetooth Music Receiver and the Logitech Wireless Speaker Adaptor are available for around half the price, as is the recently announced Philips Bluetooth HiFi Adapter. These all use older versions of Bluetooth (the Philips uses Bluetooth 2.1+EDR, for example). The supposed advantage of the StreamPort, promises Bayan Audio, is "near-CD quality" audio reproduction although with the caveat that "you must be using an aptX enabled source device for your music and ensure that your music has been digitised at a high bit-rate", recommending bit-rates of at least 320Kbits. Philips will only say that its Bluetooth HiFi Adapter enables you to "enjoy better sound than from your smartphone". Would you notice the difference? If you're using a mobile phone as your source we'd imagine you're seeking convenience over audiophile quality. In that case, you might be happy to go with a cheaper streamer, forgoing the convenience of NFC pairing and the additional range and bandwidth that Bluetooth 4.0 offers over Bluetooth 2.1. The StreamPort Universal is quick and easy to set up and it's nice to finally have a use for NFC. It's not the cheapest Bluetooth streamer out there, but if you want one that uses the latest technologies and promises the best sound, then this is the one to get.